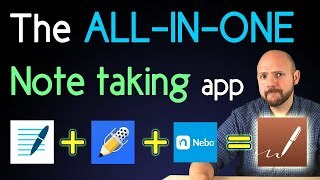 This note-taking app is THE All-In-One solution! 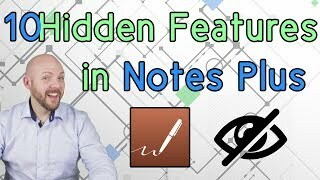 If you look for an app that has it all, the features that GoodNotes, Nebo, and Notability have on their own, then this is the right one for you. However, it is hard to learn all the features and it is not as stable as Noteshelf2 or Notability. Supported Devices This app is available on these devices. Supported Cloud Services Which cloud services are supported? Audio Recording Is it possible to record audio in the notes? Notebook Password Protection Is a password protection available? Apple Pencil Support Does the app support Apple Pencil? Vectorized Ink Does the app use vectorized ink for drawing/writing? Handwriting recognition Does the app support handwriting to text conversion? Handwritten Equation Recognition Is it possible to convert handwritten equations into plain text formulas? Recognition of Diagram Drawings Is it possible to convert hand drawn diagrams into solid shapes? Handwriting Recognition Accuracy How accurate is handwriting recognition if available? Straight Lines Tool Does the provide a tool that allows to draw straight lines or simple shapes? Variety of Pen Styles How many options are available to choose from for the stylus? Change Line Style Afterwards Is it possible to change Style of a drawn line afterwards? Drag & Drop export from Notebook Is it possible to drag and drop parts of the notebook (e.g. written text) into another app? Drag & Drop import Is it possible to drag and drop things (e.g. pictures) from other apps such as a browser? Drag & Drop within the app Is it possible to drag and drop things within the app from one notebook to another? Splitescreen Support Is possible to run the app in splitscreen mode along with another app? Moving Pages to Other Notebooks Is it possible to move pages from one to another notebook? Clickable Hyperlink Is it possible to have clickable hyperlinks in the app? PDF Import Is it possible to import PDFs into a notebook? PDF Annotation Is it possible to annotate an imported PDF in any way? PDF Text is Searchable / Selectable? Is it possible to search the imported PDF document and/or select text? Coloured Highlighter behind PDF text? When text within the imported PDF document is highlighted. Is it covering the text or does it stay behind? Customize Notebook Covers Is it possible to customize the notebook covers in this app? Import Custom Page Templates Is it possible to import own custom templates into the app to us as cover as a page layout? Bullet points (clickable) Is it possible to insert bullet points that can be ticked off? Automated Date/Time Stamp per Page Is there a date/time stamp per page in the app? Integrated Webbrowser Does the app provide an native webbrowser? Import of animated GIFs Is it possible to import GIFs that show their animation in the notebook? Import Playable Videos Is it possible to import videos that can by played within the note? Import of Photos / Live Camera Picture Is it possible to import photos or take a picture with the camera and save it in the note? Add Individual Tags to Pages Is it possible to use Tags with pages to search through the note books? Add Bookmarks to Pages Is it possible to bookmark certain pages? PDF Outlines / Digital Planner import Is the PDF Outline after importing clickable so that it jumps to the clicked section? This allows import of digital planners. Global Search Is it possible to search for keywords through all Notebooks or only within one notebook? Calendar integration Does the app provide a calendar function?